3’3’-cGAMP (cyclic [G(3’,5’)pA(3’,5’)p], previously known as cGAMP) is a cyclic di-nucleotide produced by bacteria. 3’3’-cGAMP is also referred to as "canonical" cGAMP due the presence of the classical 3’-5’ phosphodiester linkages between the guanosine and the adenosine. Recently, 3’3’-cGAMP was reported to bind STING (stimulator of IFN genes) and subsequently induce TBK1-IRF3-dependent production of IFN-β . Studies in bacteria revealed that 3’3’-cGAMP serves as a second messenger and plays a role in bacterial chemotaxis and colonization . 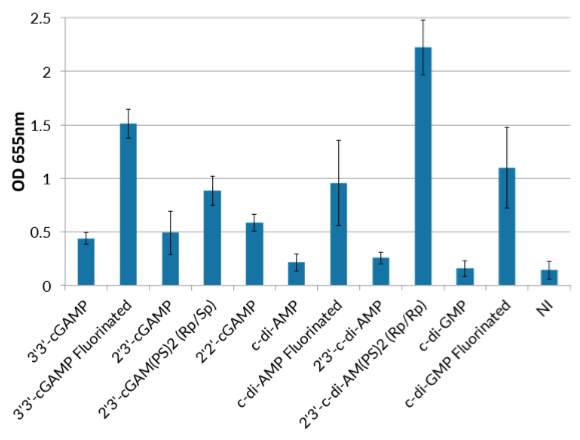 Structural and functional studies revealed that the canonical 3’3’-cGAMP produced by bacteria is distinct from the noncanonical 2’3’-cGAMP produced by mammalian cGAS . 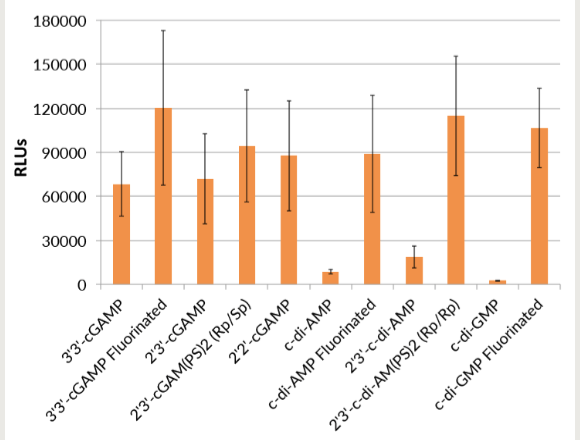 Certain variants of STING are able to distinguish between canonical and noncanonical cGAMP . 3’3’-cGAMP is more potent in activating IRF3 than c-di-IMP, c-di-AMP and c-diGMP, other 3',5' cyclic dinucleotides that also bind to STING . 4. Diner E. et al., 2013. The Innate Immune DNA Sensor cGAS Produces a Noncanonical Cyclic Dinucleotide that Activates Human STING. Cell Rep. 3(5):1355-61. 5. Burdette D. et al., 2011. STING is a direct innate immune sensor of cyclic di-GMP. Nature. 478(7370):515-8. Synonym: Cyclic [G(3’,5’)pA(3’,5’)p], cyclic GMP-AMP; c-GpAp sodium salt. Purity: ≥ 95% by LC/MS. Solubility: 50 mg/ml in water. Product should be stored at -20°C. Product is sterile filtered prior to lyophilization. Sublingual targeting of STING with 3'3'-cGAMP promotes systemic and mucosal immunity against anthrax toxins. IL-26 Confers Proinflammatory Properties to Extracellular DNA. cGAS-mediated stabilization of IFI16 promotes innate signaling during herpes simplex virus infection. Orzalli MH, Broekema NM, Diner BA, Hancks DC, Elde NC, Cristea IM, Knipe DM. Induction of Interferon-Stimulated Genes by IRF3 Promotes Replication of Toxoplasma gondii. Majumdar T, Chattopadhyay S, Ozhegov E, Dhar J, Goswami R, Sen GC, Barik S.
The tumor suppressor PTEN has a critical role in antiviral innate immunity. Li S, Zhu M, Pan R, Fang T, Cao YY, Chen S, Zhao X, Lei CQ, Guo L, Chen Y, Li CM, Jokitalo E, Yin Y, Shu HB, Guo D.
The E3 Ubiquitin Ligase AMFR and INSIG1 Bridge the Activation of TBK1 Kinase by Modifying the Adaptor STING. Age-Enhanced Endoplasmic Reticulum Stress Contributes to Increased Atg9A Inhibition of STING-Mediated IFN-β Production during Streptococcus Pneumoniae Infection. Activated STING in a Vascular and Pulmonary Syndrome. Liu Y, Jesus AA, Marrero B, Yang D, Ramsey SE, Sanchez GA, Tenbrock K, Wittkowski H, Jones OY, Kuehn HS, Lee CC, DiMattia MA, Cowen EW, Gonzalez B, Palmer I, DiGiovanna JJ, Biancotto A, Kim H, Tsai WL, Trier AM, Huang Y, Stone DL, Hill S, et al. HIV-1 evades innate immune recognition through specific cofactor recruitment.